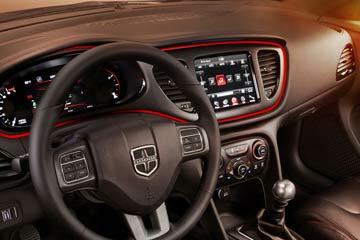 At Davis Dodge, you could find yourself behind the wheel of a Dodge Dart. 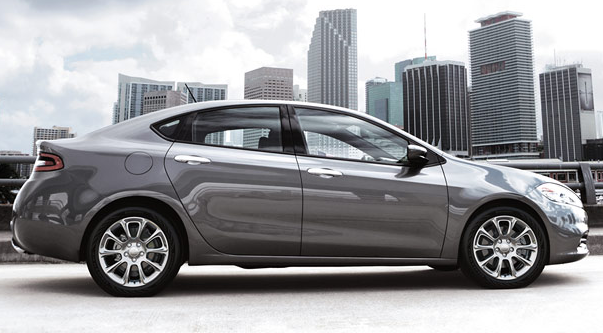 The Dodge Dart lets you express your personal style in different ways. It begins with an array of exteriors to fit almost anyone. 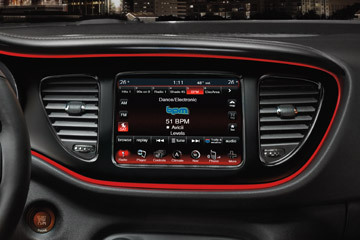 On the inside, the Dart is incredibly equipped with features like an available Radio 8.4 multimedia centre with an 8.4-inch touchscreen – the largest in its class. There are 6 different Dart models; SE, SXT, Blacktop, Aero, GT and Limited. Talk with one of our representatives today, and learn why vehicle buyers come from Calgary, Lethbridge and Claresholm for a shopping experience at Davis Dodge. 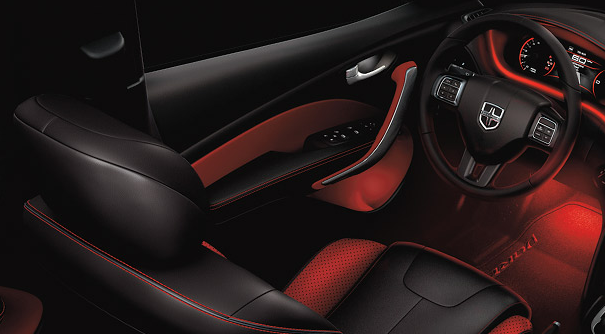 The interior starts with the driver in a purpose-built, fluid layout designed to be both stunning and ergonomic. It features ambient lighting to highlight the interior craftsmanship and refinements like soft-touch surfaces, accent stitching on the dash and seats, tactile grains and available hand-wrapped surfacing. The Dart is also a compact sedan that offers interior space you'd expect in a larger vehicle, with a total interior passenger volume of 2,752 L (97.2 cu ft) and cargo capacity of 371 L (13.1 cu ft). 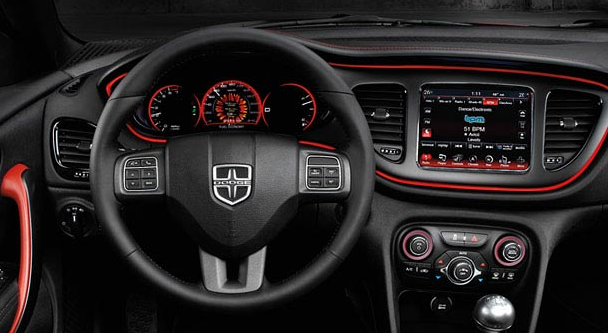 The Dodge Dart is available with a leather-wrapped heated steering wheel – a feature normally associated with more expensive vehicles. Enjoy the sporty grip for invigorating drives and take on those cold winter mornings without skipping a beat. 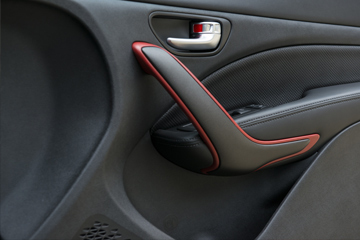 Customize your comfort with this available feature. It enables the driver and front passenger to control 2 distinct temperature zones. Maintain your desired temperature with this exceptionally quiet and efficient feature. 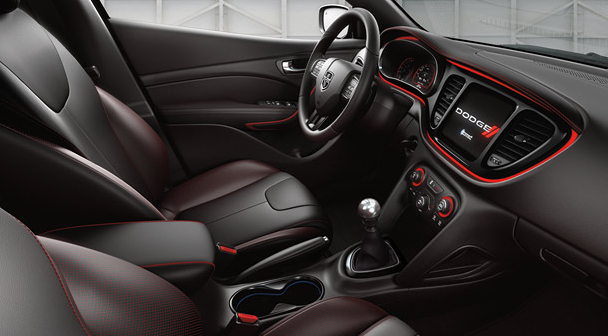 Double-stitched surfaces highlight the Dart's award-winning interior quality and sophisticated execution. The tactile grain surface produces a low-gloss appearance, with a pleasant-to-the-touch feel that resists scratching or marking. We call it the Floating Island Bezel. The stunning visual effect is achieved by a ridge of LED lighting around the bezel that makes the instrument panel appear to be "floating" in air. 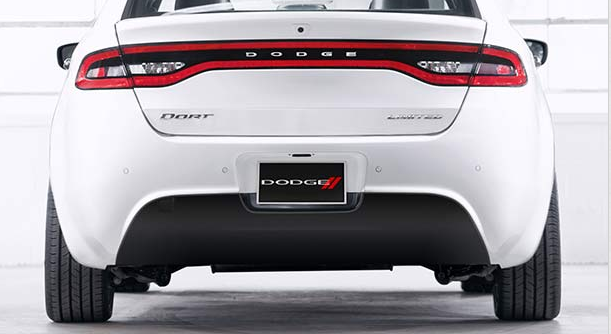 Full-width LED racetrack taillamps are inspired by the Dodge Charger. 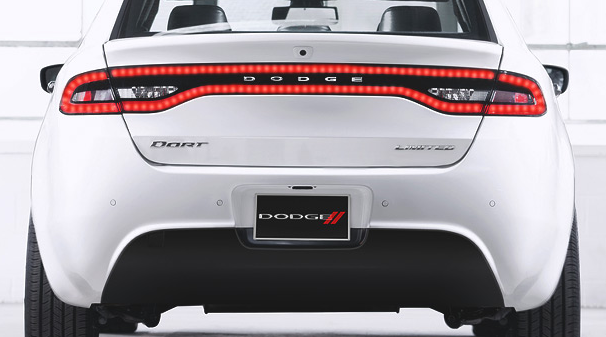 Make your unique Dodge heritage and road presence known with these bright and long-lasting taillamps. 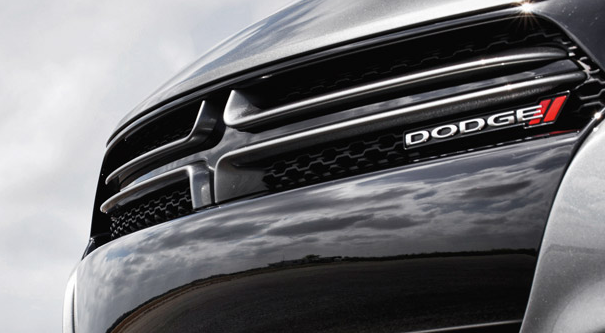 The signature Dodge crosshair grille design undergoes a contemporary interpretation. It is clean yet sophisticated, with an available Piano Black insert recessed into the crosshairs. Each model sports its own unique crosshair and surround colour combination. 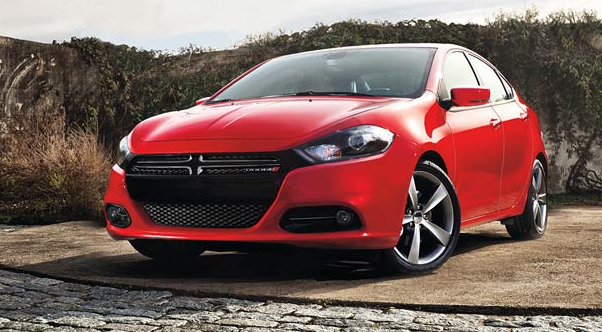 The Dart adds to its design with advanced technology through an available active grille shutter system for exceptional aerodynamic performance. 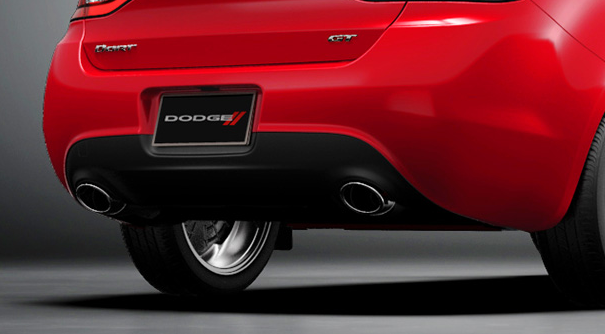 With the available fascia-mounted 3-inch chrome dual exhaust tips, the Dodge Dart offers a feature more commonly reserved for more expensive mid-size vehicles. Over 600 hours of wind tunnel testing have resulted in features that refine the Dodge Dart's superb aerodynamic performance. These features include available underbody treatments and an innovative active grille shutter system that automatically closes airflow through the lower intake as required, reducing drag by up to 7 percent. 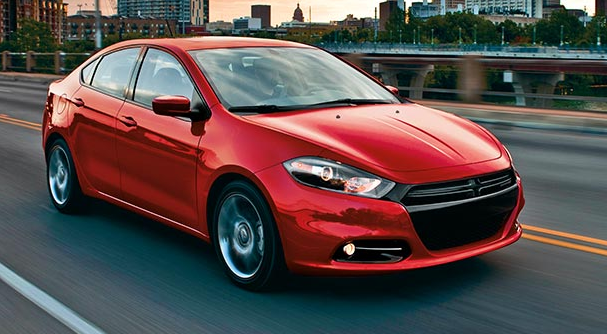 The 2016 Dodge Dart delivers impressive fuel economy as efficient as 5.8 L/100 km (49 mpg) highway. 2-cycle method. It now takes into account air conditioner usage, cold temperature operation, and higher-speed driving with more rapid braking and acceleration for more realistic numbers. While the 5-cycle fuel efficiency ratings are different than the 2-cycle ratings, actual fuel efficiency has not changed – the way it is calculated has. 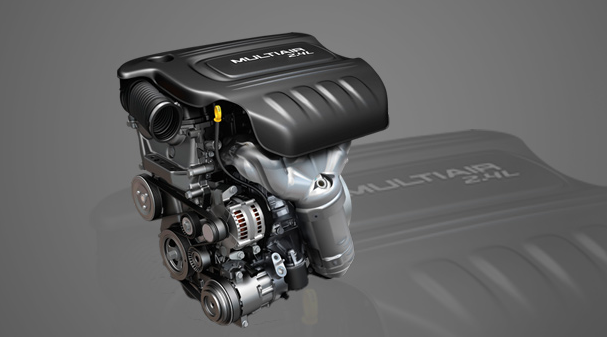 MultiAir® technology delivers optimum performance across the rpm range by allowing direct and dynamic control of air intake and combustion. The result is up to a 15 percent increase in low engine rpm torque and up to a 7.5 percent improvement in fuel efficiency. 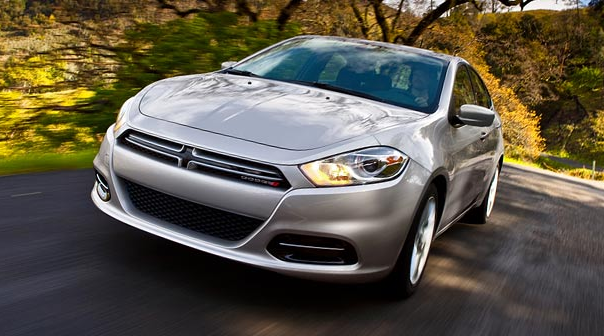 With 3 advanced transmissions to select, the Dodge Dart can suit just about any driving style. The 6-speed close-ratio manual transmission connects you to the drivetrain for a pure driving experience. For those who prefer a smooth feel, the 6-speed PowerTech and the available Dual Dry Clutch Transmission (DDCT), each with Auto/StickTM, offer drivers the best of both worlds (DDCT is available with the 1.4L MultiAir® I-4 Turbo). 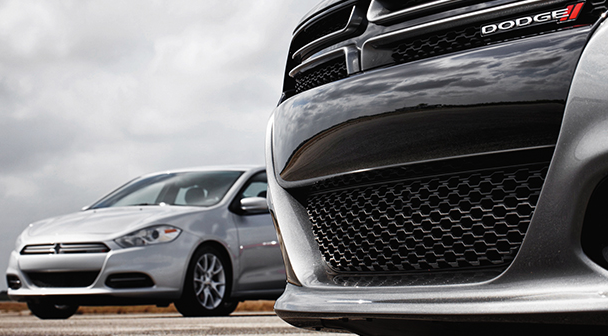 The available active grille shutter system on the Dart was a first for Dodge. At highway speeds, airflow is automatically stopped through the lower intake to lower aerodynamic drag. With the amount of air cooling dependent upon vehicle speed, the active grille shutter system opens or closes automatically based upon engine coolant temperature, resulting in better fuel economy. The 2.4L TigersharkTM MultiAir® I-4 that powers the GT gets unique engine calibrations for the exhaust and intake timing of its advanced MultiAir system along with different gear ratios. The result is 184 horsepower and 174 lb-ft of torque that together provide added driving dynamics to put a smile on any enthusiast's face. 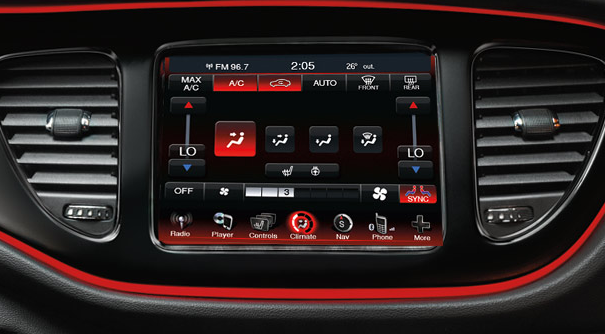 There's an array of available Class-Exclusive features for the 2016 Dodge Dart. 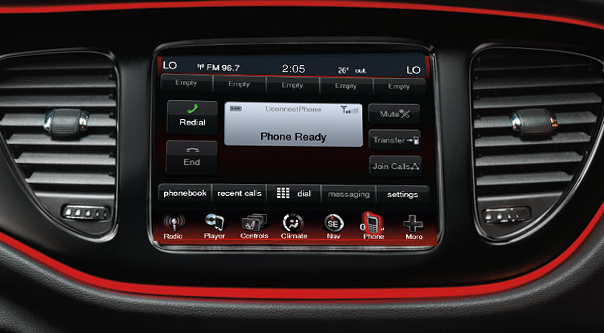 It includes a premium 7-inch customizable in-cluster display. The display delivers real-time information on performance, available navigation and vehicle status. Even more impressive, it can be reconfigured in full colour and incredibly rich graphics never before seen on a compact car. It is standard on the Aero, GT and Limited. 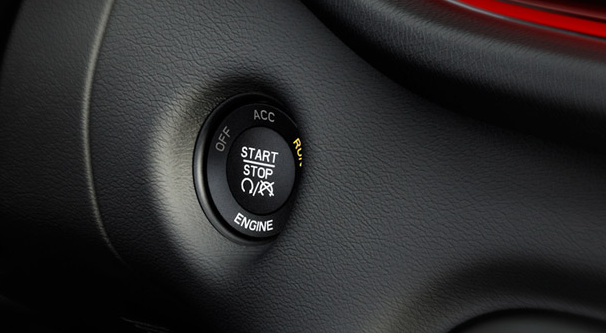 Opt for Keyless Enter 'n GoTM with push-button start and get absolute convenience. This available feature allows passive vehicle entry, trunk release and keyless engine start, all activated via a smart fob. It's simple to use: with the key fob in your pocket or purse, doors will unlock with a touch of the handle and your car will start with the push of a button. Working in tandem with the vehicle security system, it combines advanced anti-theft protection and engine immobilization. 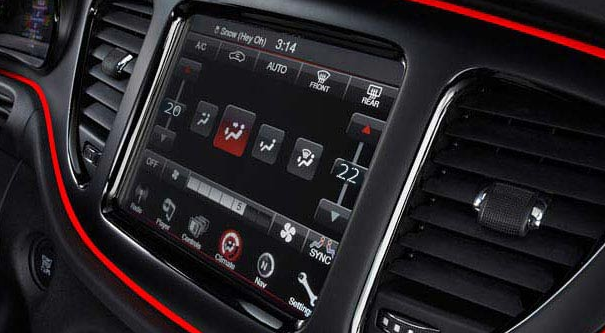 The Radio 8.4 multimedia centre with largest-in-class 8.4-inch touchscreen has easy-to-navigate icons for radio and climate controls and for personal media devices. Radio 8.4 also features the Floating Island Bezel around the gauge cluster and radio screen. Backlit in Ruby Red, the bezel is optional on the SXT and standard on the Aero, GT and Limited. 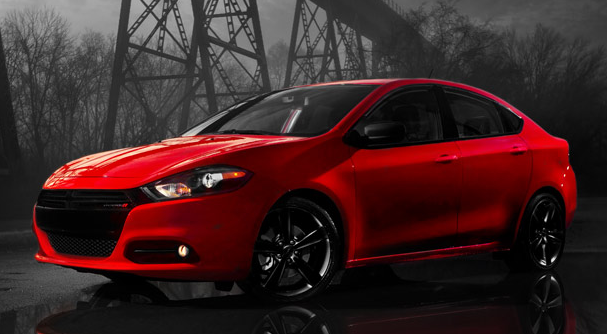 The Dodge Dart is constructed from advanced high-strength, hot-stamped steel to offer an exceptionally stiff overall structure and a safety cage for outstanding protection. 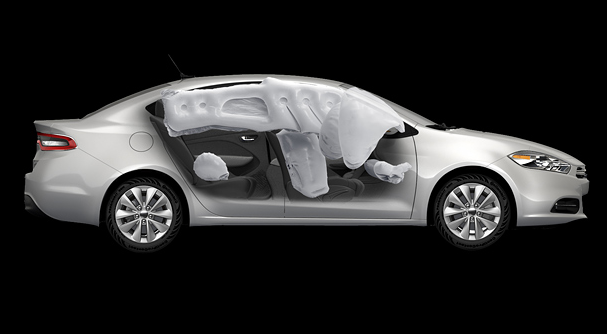 It's one of the safest vehicles in its class thanks to 10 standard air bags, reactive front head restraints and available options like Blind-Spot Monitoring with Rear Cross-Path Detection. 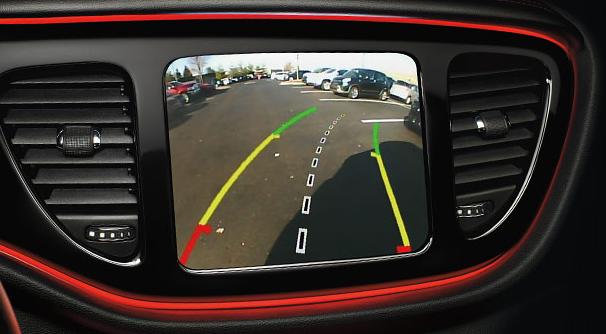 The available ParkView® Rear Back-Up Camera automatically activates when the Dart is shifted into Reverse, enabling the driver to confidently see objects or people behind the vehicle. The available Park-Sense® Rear Park Assist System incorporates sensors on the rear bumper fascia to monitor 10 different zones: 6 in the centre and 2 each on the right and left sides. The integrated sensors send out ultrasonic waves when the vehicle is driven in Reverse at low speeds. If an object is detected, a visual alert in the instrument cluster and an audible chime notify the driver of its proximity. 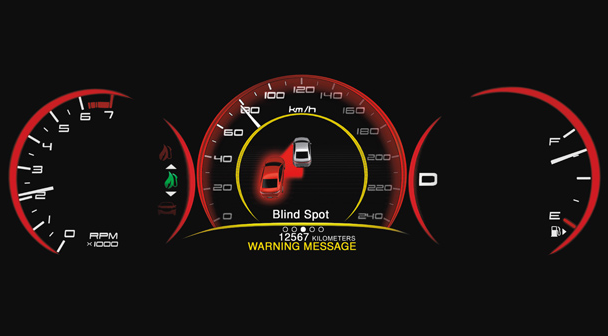 Constantly monitor the rear blind zones with the available Blind-Spot Monitoring with Rear Cross-Path Detection. This technology observes either side of the vehicle via radar sensors. 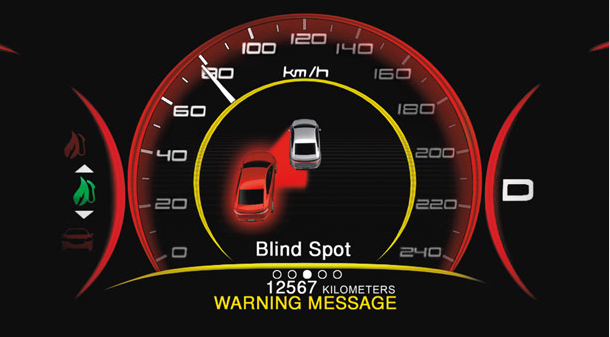 If another vehicle is in the blind spot, you are notified by a visual signal in the outside rearview mirror and an optional audible alert. This safety system combines rear proximity and cross-path sensors for optimum parking awareness. It's a safe, simple and automatic system that warns of any cross traffic moving toward the vehicle whenever you shift into Reverse. Electronic Stability Control (ESC) and 4-wheel antilock disc brakes – Canadian road conditions can change with the weather. 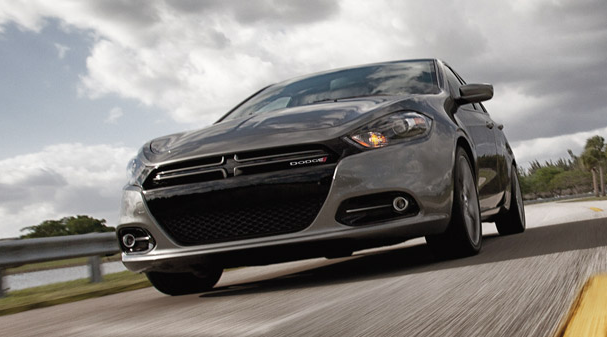 The Dart's standard ESC helps the driver maintain vehicle directional stability and limits oversteer or understeer. ESC includes All-Speed Traction Control, Brake Assist, Electronic Roll Mitigation, Hill Start Assist, Brake Lock Differential and Trailer Sway Control. Brake Assist – This system detects how fast the driver is applying the brakes in the event of an emergency braking situation, and boosts brake pressure as needed. Ready Alert Braking – The system pre-charges the brake system to decrease the time required for full brake application by anticipating situations when the driver may initiate an emergency brake stop. The reactive front head restraints help lower the risk of head and spinal injuries by reducing the space between the headrest and head, and by moving forward and upward during a rear-end collision.